The airport is located 6 miles southwest of Balboa, at the southern (Pacific) end of the Panama Canal. Most of the area around it was uninhabited and formed part of the Panama Canal Zone watershed, although Panama City could be reached by crossing the nearby Bridge of the Americas. For over 50 years, Howard Air Force Base was the bastion of US air power in Central and South America. In its heyday, it was the center for counter-drug operations, military and humanitarian airlift, contingencies, joint-nation exercises, and search and rescue. It was the hub of Air Force operations in Latin America, boasting fighters, cargo planes, tankers, airborne warning and control system aircraft, operational support airlift "executive" jets, and search and rescue helicopters. It was also home to a host of transient U.S. Army and U.S. Navy aircraft. Personnel assigned to tenant commands at Howard AFB tracked drug traffickers out of South America, and its cargo aircraft, primarily rotational C-130 Hercules aircraft from the active duty U.S. Air Force, the Air Force Reserve and the Air National Guard, provided theater airlift for United States Southern Command (USSOUTHCOM) contingencies, exercises, and disaster relief, and conducted search and rescue in the vast region. Only a portion of the transports, several special-mission C-130s, two C-27 Spartan aircraft, and executive jets belonged to the host unit, the 24th Composite Wing, later redesignated the 24th Wing (24 WG). Although Regular Air Force C-130 aircraft rotated to Howard AFB for 90-day detachments in the 1970s and early 1980s in the support mission called CORONET OAK, this mission was later transferred to the Air Force Reserve and the Air National Guard, which then provided C-130s for VOLANT OAK, as well as A-7 Corsair II and later F-16 Fighting Falcon fighters that also rotated into the base. Operations at Howard drew down during the summer of 1949 and all training ceased on 11 October 1949; the base was transferred in inactive status to USA, Caribbean, in February 1950. In the 1950s, Albrook AFB used Howard to reduce aircraft activity at Albrook; a joint United States Army Caribbean, and Caribbean Air Comd, USAF, agreement (18 August 1955) permitted the resumption of regular flying operations at Howard in October 1955. Carved out of the jungle 500 yards from the Pacific Ocean, it opened in 1942. It was named after Major Charles H. Howard (1892–1936), who flew in Panama in the late 1920s. The only five-star general in Air Force history, Henry H. "Hap" Arnold played a prominent role in the history of Howard AFB and military aviation in Panama. As a captain, Arnold led the first air unit, the 7th Aero Squadron, to the Isthmus on March 29, 1917. Within a week, he left for Washington, DC, and more pressing duties there. When he returned to Panama in May 1939, he was a major general and chief of the Army Air Corps. The purpose of his visit was to select a site for a new air base. He chose what is now Howard AFB and suggested the name Howard Field, in honor of Major Charles H. Howard, a personal friend and former subordinate who had served in Panama during the period 1926–1929 and who had been part of Arnold's crew on his famed flight of B-10 bombers to Alaska in 1934. Major Howard died in an air crash on October 25, 1936. On December 1, 1939, the new air base officially became Howard Field. Construction began shortly thereafter and the first troops arrived on May 15, 1941. Howard Field hosted both fighter and bomber aircraft during the World War II era. The base was inactivated on January 1, 1950 and its real estate turned over to the Army. The Air Force continued to use Howard as a deployment site for joint training exercises during the 1950s, and by December 1961 all USAF flying operations in Panama relocated to Howard. On October 1, 1963, the Air Force officially reclaimed Howard from the Army and the base played a central role in US military operations in Latin America ever since, largely due to its 8500-foot runway and its status as the only jet-capable US air field south of the Rio Grande. Control of the Panama Canal changed hands on 31 December 1999, from the United States to Panama. DoD elements began drawing down more than a year earlier, in anticipation of the deadline established by the Panama Canal Treaty of 1977. The last of the fixed-wing US aircraft departed Howard Air Force Base on 1 May 1999. 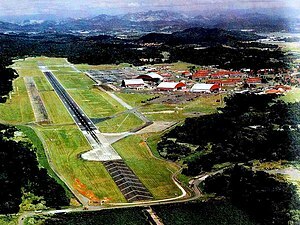 On 1 November 1999, the 24th Wing inactivated and Howard Air Force Base was turned over to the Panamanian government. ^ Hilarski, Randy (April 9, 2013). "Howard Air Force Base has Been Transformed into Panama Pacifico". Panama Simple. Retrieved 2015-04-08.